Nancy Grace is speculating that Casey Anthony may be in hiding near Hollywood according to last night’s show. 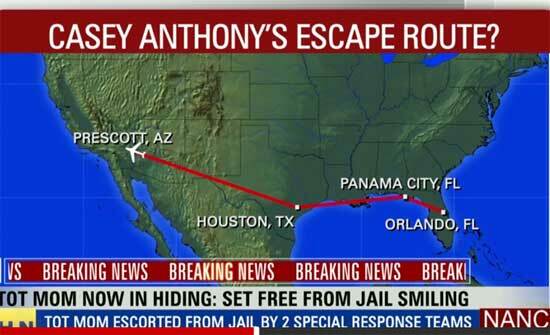 The image above shows the possible escape route Grace says Anthony took in a private jet. From Orlando flying over Panama City, to Houston Texas, over Prescott Arizona and landing in Los Angeles (speculation). Grace goes on to say that the first photos spotting a confirmed location of Anthony can go for nearly $250,000. That is unbelievable! Grace’s guest credits Jose Baez and the police department with a “masterful plan” in getting Anthony out of Florida. The only contact George and Cindy Anthony have had with Casey is when Jose Baez asked them to be decoys during Casey’s secret escape. They declined. It is still unknown where Anthony is hiding but with this many media outlets looking for her, it will not be long before she is located. Nancy Grace has been loudly and obnoxiously wrong about everything since she started jabbering about “tot-mom” three years ago. Rather than doing something about the real,issues that lead to child abuse, Ms. Grace is searching for a convenient target for revenge. To put that in perspective, while Americans have been shedding tears over Caylee, something like 82 children have died because of abuse.If Nancy G. and HLN viewers actually cared about violence against children, they’d drop their blooklust for Anthony. Nancy Grace wants ratings she needs therapy. She is out there promoting Mob Justice. Ms.Grace and her show needs to be off the air. Um Screw you guys! I hope some crazy person goes after her!